Now thatNASA?s Phoenix Mars Lander is likely dead, mission scientists have time tofully examine the treasure trove of data generated in its five months in thered planet?s arctic region, in order to shed more light on the mysteries ofMars. Phoenix?s confirmationof water ice below the Martian arctic surface and its surprisingcharacterization of the Martian dirt are among the findings researchers will bebusy investigating further in the next few months. The Phoenix mission will also help inform future missions to Mars, including the upcoming MAVENorbiter mission and the planned MarsScience Laboratory rover. In the five-plusmonths it spent alive at its landing site, the spacecraft dug up samples ofMartian dirt and subsurface water ice and analyzed them for signs of the planet'spast potential habitability. Yesterday NASAannounced that themission, whose final cost was about $475 million, was effectively over.Dwindling sunlight (caused by the transition from summer to fall at Phoenix's location, which is roughly equivalent to northern Alaska on Earth) andlight-obscuring dust in the atmosphere finally pushed Phoenix below its powerthreshold on Nov. 2. "It'srather tough living up north above the article circle, so we always knew thatthe end would be coming near for us," said Phoenix project manager Barry Goldsteinof NASA's Jet Propulsion Laboratory in Pasadena, Calif.
Phoenix's demise, while expectedto come with diminishing light and plummeting temperatures, occurred a fewweeks sooner than engineers had hoped, largely due to the poor weather at itslanding site. But even with its early death, Phoenix went above and beyond itsprimary mission goals, which were achieved by the end of its originalthree-month mission in August. "Thevehicle ? has achieved all of its science goals and then some, and I've thinkwe have had a huge success," Goldstein said. The biggestsuccess of the mission was to confirm the presence of water ice under thesurface of the Martian arctic ? which had first been detected by the MarsOdyssey orbiter in 2002 ? though that discovery didn't come right away. "Whenwe landed, we looked around, we saw a field of dirt and rocks that was spreadout to the horizon, and we didn?t see ice right away, it wasn't until we lookedunderthe spacecraft that we found out we were standing on it, and this was quitea thrill for everybody," said Phoenix principal investigator Peter Smith ofthe University of Arizona in Tucson. Over thecourse of the mission, Smith and his team used Phoenix's robotic arm andanalysis instruments to scrape, poke, prod and characterize this rock-hard icelayer. "We'veexcavated to the ice, we know its depth, we know how it changes over thesurface, we've seen different types of ice," Smith said, adding that theanalysis of the ice isn't over. In diggingdown to the subsurface ice layer, Phoenix also scooped up samples of theoverlying dirt and analyzed them in its microscopes, wet chemistry lab (whichdissolved the samples in water to look for soluble chemicals) and Thermal andEvolved-Gas Analyzer (TEGA) (which baked the samples and analyzed the vaporsgiven off). These analyses led to some surprising findings. Unlikeother landers and rovers that have detected acidic dirt with plenty of sulfates? indicative of volcanic activity ? Phoenix found the dirt at its landing sitewas alkaline with lots of carbonates and clay minerals, the later of whichtypically form when liquid water is around. "Onthe Earth, we would conclude immediately that there was liquid water in thissoil ? for Mars we have to be a little more careful, and we're going to developthis story as we can, as we interpret our data," Smith said. "Butdefinitely liquid water has been a part of this soil" in the past. 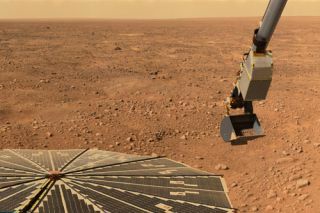 The dirtsamples also showed evidence of salts and perchlorate.Perchlorate was "totally unexpected," Smith said, and "hasprofound implications for Mars," because it can act as a potential energysource for microbes. "Andthat leads to the question, is this a habitable zone? Have we found such athing on Mars?" Smith said. The analysis the team will carry out now willaim to help answer those questions, he said. Such research could set the stagefor future missions that might actually look for biology on the red planet. Phoenix also took roughly 25,000 picturesduring its tenure on Mars, from complete 360-degree panoramas to close-up peeksat the ice in trenches it dug. The landeralso took weather measurements, including pressure, temperature, winds, and humidity. "We'vegot a complete weather record for the entire time we were there," Smithsaid, adding that it was "one of the major accomplishments of the mission." Towards theend of the mission, the team even saw frost forming on the surface and snowfalling from the sky. "Thisis really unexpected, and I think a first to see it, especially from thesurface," Smith said. Thoughmission team members were disappointed by the lander's premature demise, theylooked forward to the information it would bring them on Mars. "Whilewe're losing a spacecraft, it's really an Irish wake rather than a funeralwe're looking forward to here," said Dough McCuistion, director of theMars Exploration Program at NASA Headquarters in Washington, D.C. "Weshould celebrate what Phoenix has done, what the Phoenix team has done, andwhere it's going to take us in the future." Up next forMars are the planned Mars Science Laboratory mission, currently still slatedfor a 2009 launch, and the next member of the Scout mission (of which Phoenix was the first) ? the MAVEN orbiter. MAVEN willexamine the upper and middle atmosphere of Mars to understand how materials,especially water, escape from the planet's gravitational pull. Understandingthis link of Mars' water cycle will help scientists "to understand whatthe history of liquid water on the surface of Mars may have been in the past,"McCuistion said. Phoenix's success "has really set astandard for future Scout missions," he added. Even withits success, Phoenix ran into its share of snags. "A lot of lessons [were]learned in this mission," McCuistion said. The unexpectedstickiness of the Martian dirt made it difficult to deliver samples to thelander's instruments, as they would get stuck in openings and to the roboticarm's scoop. "Welearned a lot about handling of soils, soil consistency and how difficult itcan be," McCuistion said. Along thoselines, the team learned "how difficult it is to handle ice when itsublimes quickly in the atmosphere," he added. Butoverall, NASA was pleased with the Phoenix mission and its accomplishments, aswere the members of the team who planned, built, and operated the lander. "I'mjust thrilled to death with what we've been able to do here," Smith said.